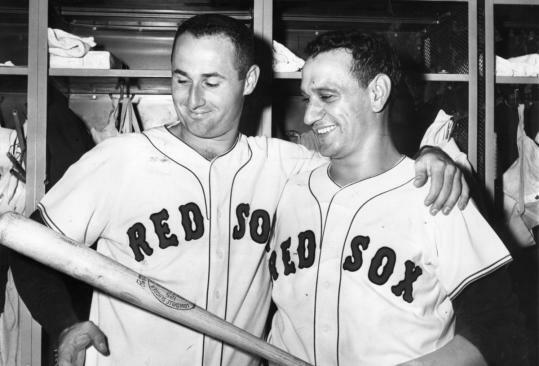 Frank Malzone was a valued member of the Boston Red Sox family from the time he signed a minor league contract with the team in 1948, until his death on December 27, 2015. His almost 70-year association with the team produced notable achievements on the field, a host of long-term relationships, and many acts of thoughtfulness on his part. 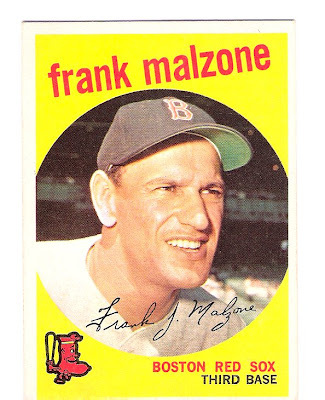 Malzone was a three-time Gold Glove third baseman for the Red Sox, playing with the club from 1955 to 1965, and he was an American League All-Star in six seasons. He was voted as the top third baseman on the Red Sox All-Time Team in 1969, and he was placed onto the second team based on fan voting in 1982. “Malzie,” as he was fondly known by teammates and friends, entered the Red Sox Hall of Fame with the first round of inductees in 1995. The Malzone’s were married in 1951, and they were together for 55 years before Amy’s death in 2006. They settled in Needham, MA, when Frank broke in with the Red Sox and they raised their four boys and a daughter in their adopted community. Frank’s debut with the Red Sox was delayed by injuries and two-years of service in the U.S. Army. 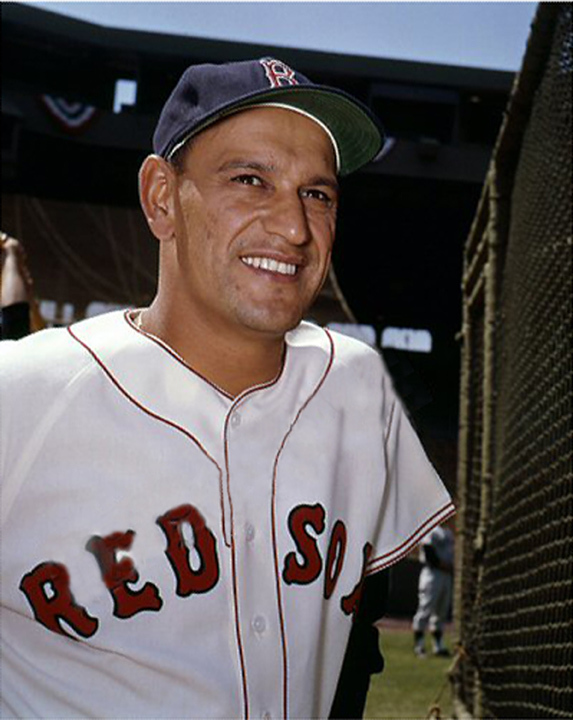 He appeared in six games with Boston in 1955, 27 games in 1956, and in 1957, he took over as the every-day third baseman for the Red Sox. Once Frank made it to Boston to stay full-time with the Red Sox he immediately made up for lost time. New York Yankees’ manager Casey Stengel named him to the 1957 American League All-Star team in his first full season. That year he also became the first player to lead American League third basemen in games, putouts, assists, double plays and fielding average. The Rawlings Golden Glove for fielding excellence began in 1957 and initially it went to the best fielder at each position among all major leaguers. Frank Malzone was the Gold Glove winner in that first year and when seperate awards were given for the American and National Leagues, he won again in 1958 and 1959. He remains the only Red Sox third baseman to win a Gold Glove. In 1967, he re-joined the Red Sox as an advance scout just in time for the Impossible Dream season. His scouting reports helped the Red Sox to defeat the Minnesota Twins for the American League pennant and to force the St. Louis Cardinals to seven games in the World Series. 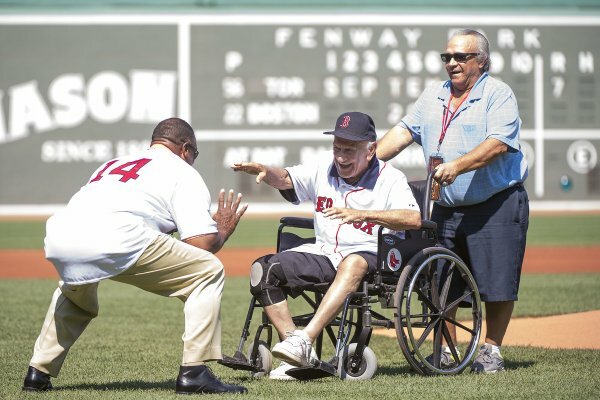 His contributions as a scout and instructor for more than 50 years were invaluable to the Boston Red Sox. 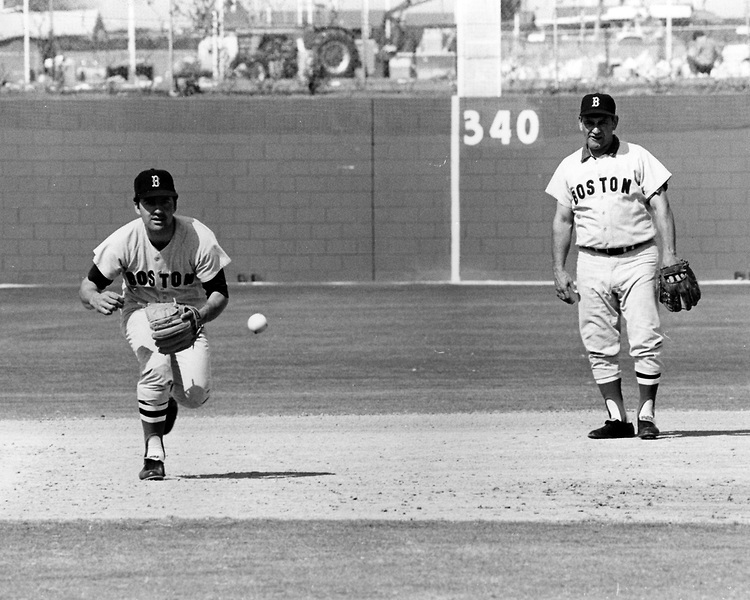 Rico Petrocelli takes infield practice at third base during spring training as Frank Malzone looks on. Frank Malzone was an important link between the Ted Williams’ era and the Carl Yastrzemski era. Frank and Ted Williams were fellow All-Stars and Frank was in the line-up for Ted’s last game at Fenway Park on September 28, 1960. And the following spring, he was in the lineup for Yaz’s first major league game on April 11, 1961, at Fenway Park. Frank Malzone was a man of few words. Like so many men of few words he preferred to take positive actions rather than talk about them. But like so many men of few words, everyone one of his words was important! Thanks, Herb for posting this so I could read it. I loved it . For the past year I did everything with him. He was my golf coach last season so he died doing what he loved most: coaching. Thank you Jim for your thoughtful words. Your dad was a very special man.